Texas A&M University, often called A&M or TAMU, is a coeducational public research university located in College Station, Texas. It is the flagship institution of the Texas A&M University System. It opened in 1876 as the Agricultural and Mechanical College of Texas, the first public institution of higher education in that state. 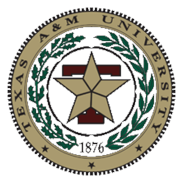 In 1963, the Texas Legislature renamed the school to Texas A&M University to reflect the institution's expanded roles and academic offerings. The letters "A&M" no longer have any explicit meaning but are retained as a link to the university's past. The nickname "Aggie" refers to students, alumni, and sports teams of Texas A&M. Texas A&M's designation as a land, sea, and space grant institution reflects a broad range of research with ongoing projects funded by agencies such as NASA, the National Institutes of Health, the National Science Foundation, and the Office of Naval Research. Working with agencies such as the Texas AgriLife Research and Texas AgriLife Extension Service, Texas A&M has a direct presence in each of the 254 counties in Texas. The university offers degrees in over 150 courses of study through ten colleges and houses 18 research institutes. Texas A&M has awarded over 320,000 degrees, including 70,000 graduate and professional degrees. As a Senior Military College, Texas A&M is one of three public universities with a full-time, volunteer Corps of Cadets. It provides more commissioned officers to the United States Armed Forces than any other school outside of the service academies. From humble beginnings in 1876 as Texas' first public institution of higher learning, to a bustling 5,000-acre campus with 46,000-plus students and a nationally recognized faculty, Texas A&M University is one of a select few universities with land-grant, sea-grant and space-grant designations. With an enrollment of about half men and half women, 25 percent of the freshman class are the first in their family to attend college and 8,500 are graduate students. Texas A&M has two branch campuses, one in Galveston, Texas, and one in the Middle Eastern country of Qatar. This research-intensive flagship university with 10 colleges was recently ranked first in the nation by The Washington Monthly for "tangible contributions to the public interest." U.S. News and World Report ranked Texas A&M third nationally as a "best value" among public universities. Many degree programs are ranked among the top 10 in the country. Opened in 1876 as Texas' first public institution of higher learning, Texas A&M University is a research-intensive flagship university with 46,000-plus undergraduate and 8,500 graduate students studying in over 250 degree programs in 10 colleges. Students can join any of 800 student organizations and countless activities ranging from athletics and recreation to professional and community service events. But there's more than just numbers that make up the Aggie experience. There's access to world-class research programs and award-winning faculty. There are opportunities to learn in and out of the classroom whether through technology or through one of our branch campuses or international study centers. At Texas A&M, students have a wealth of opportunity to pursue their lifelong career goals. Many of Texas A&M’s degree programs are ranked in the top 10 nationally. With a comprehensive selection of majors and numerous extracurricular activities to hone their skills in academics, leadership and public service, a college experience at Texas A&M results in highly sought-after graduates and solid world citizens. With more than 120 undergraduate degree programs and more than 240 master's and Ph.D. programs to choose from, the university enrolls one of the 10 largest student bodies in the nation—and the largest outside a major metropolitan area. Fall 2007 enrollment is a record 46,542, with a record 8,085 entering freshmen. The average SAT score for freshmen is 1208, almost 200 points above the national average. Texas A&M consistently ranks among the country's top universities in attracting National Merit Scholars. The university is home to one of the largest chapters of Phi Beta Kappa, the nation's oldest and largest academic honor society. Texas A&M ranks at the top statewide in student retention and graduation, making it the university of choice for students from all walks of life. The Dwight Look College of Engineering has the largest enrollment of 20.5%. The College of Liberal Arts and the College of Agriculture and Life Sciences follow, enrolling 15% and 14% of the student body, respectively. Mays Business School enrolls about 11%. the College of Veterinary Medicine & Biomedical Sciences. Approximately 8% of the student body has not declared a major. The 2008 U.S. News and World Report ranks Texas A&M 62nd, tied with Worcester Polytechnic Institute, among all American universities and 23rd among public universities. The Washington Monthly ranks the school 1st nationally with criteria based on research, community service, and social mobility. Newsweek International ranks Texas A&M as the 77th university globally based on "openness and diversity" as well as "distinction in research".Shanghai Jiao Tong University ranks the university 50th nationally and 88th internationally based on educational quality, faculty quality, and research output. The Times Higher Education Supplement ranks Texas A&M 60th among the world's top 100 technology universities, 24th among America's top biomedicine universities, and 50th among North America's top 50 universities. The 2008 Kiplinger's Personal Finance ranks the school as the 25th best value public university based on in-state tuition, and the 9th best value public university based on out-of-state tuition.In addition, Hispanic Magazine ranks Texas A&M as 23rd nationally for Latinos, while New Mobility magazine ranks the university as one of the top ten "disability-friendly" colleges. The John Templeton Foundation listed Texas A&M as one of the thirty-five American college programs that "communicate[s] the values of honesty, trust, respect, responsibility, integrity, and fairness in the classroom"